The Haein-sa (temple) is one of the three main temples in South-Korea. Its name means "Reflection on a calm sea". It belongs to the Chogye Order, a Zen school of Buddhism. Haein-sa houses all the Buddhist texts carved on wooden blocks, symbols of the teachings. The blocks, known as Tripitaka Koreana, number 81.340 in total. Inscribed are the rules for monks, the teachings of the Buddha and the commentaries added down the ages. The entire Tripitaka has been carved twice. The first one was completed in 1087, but it was burnt in the invasion of the Mongolians. So the monks started carving again, and that one (that now can be seen) dates from 1251. This is probably the best sight I have seen in Korea. Beautifully located in the mountains (in a national park actually), miles from everywhere. 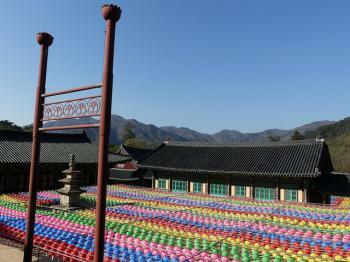 Haeinsa is a big and colourful templecomplex. There is a lot to see and to do in the area. The wooden bloks are of course the main point of interest. They are housed in 4 buildings behind the main temple. You can look at them via the windows. Remarkably, the blocks are still in their original housing, and due to the way of construction they are well preserved. A few years ago a new building was erected for them, but the condition of the carved blocks started deteriorating quickly. So they moved them back, in their original places. I visited the Heinsa temple in the first week of May 2016. I participated in temple stay program - 1 night 2 days. I was expecting guided meditation and stuff, but we were allowed to explore and do everything on our own. It would have been great if it was more organised, guided and if we were informed of the tea with monk timing(I Missed that) and about the meal timings etc. You are supposed to bow whenever you encounter a monk. Sometimes the elderly monks are friendly and has a small talk with you while you explore the temple. The temple is famous for its Tripitaka Koreana - the whole of the Buddhist Scriptures carved onto 81,350 wooden printing blocks which have withstood the test f time. The temple has housed them since 1398. Not sure if they allow the pictures of Tripitaka Koreana. I was told off by the Security. The temple has a stone lantern, a three story stone pagoda in front of the courtyard of the Main hall (Daejeokkwangjeon). There is a bell pavilion in the first courtyard - consisting of The “Four Instruments” of a Buddhist temple. This include a bell, a drum, a wooden fish and a cloud plate symbolically used as elements for broadcasting Dharma to beings of the earth(bell), beings who are dead (drum), beings of the waters (fish), and beings of the air (cloud). Do not forget to visit the Hill of scholar there. It is nothing but a fir tree next to the monastery. This was a cane used by a famous scholar who spent his last days in seclusion at Heinsa. I got up early and joined the prayers on the main hall. The temple was decorated for Buddha purnima which was happening the week after. It was beautifully decorated. I was able to take some cool pictures. 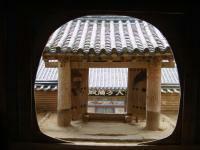 It is one of the oldest temples in South Korea - more than a thousand year old. So it is a must visit place according to me. The breathtaking view of the mountain around Heinsa and the silence itself is more than enough to give you a calm soulful experience. When you are at Heinsa, you are one with nature. Read more from Vinaya here. I visited this WHS in April 2017 while following a 2 day 1 night regular program templestay. I enjoyed getting a general overview of meditation and different insights from a Buddhist monk even though my primary aim was to enrich my visit to this WHS and be able to appreciate its OUV without the presence of busloads of tourists. For this reason I was very pleased with the templestay in general although I'd recommend staying at a less famous mountain temple if possible to get a less touristy approach. I had already experienced Buddhist monastery life in Laos, Myanmar and Nepal and I found them to be much less touristy and more authentic experiences than the templestay in South Korea. Still it is a very interesting experience and a good alternative to the budget accomodation options available near most mountain temples. I enjoyed learning about the temple etiquette that lay Buddhists are supposed to follow. Haeinsa Temple is located at 400 metres above sea level beneath the Gaya mountain at the heart of the Gayasan National Park. To reach the temple, I caught a bus to Daegu and another bus to Haeinsa proper. If you show your templestay reservation you won't have to pay the entrance fee to the Gayasan National Park which is collected at the toll station on the bus itself nor the entrance ticket to Haeinsa Temple itself. When I visited, the temple was colourfully adorned with prayer lanterns to celebrate Buddha's birthday (picture). The UNESCO stone marker is just opposite the entrance to the temple (some 1.5km uphill from the bus stop). 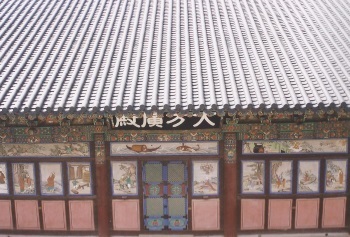 Even though the Haeinsa Temple buildings are quite interesting and kept in very good condition, the main reason for its separate inscription as a WHS are the depositories of the Tripitaka Koreana, believed to be the world's oldest and most comprehensive intact version of Buddhist canon in Chinese script, with no known errors. It is carved onto 81,340 wooden printing blocks with over 52 million characters which are organised in 1514 titles and 6791 volumes. A team of around thirty scribes completed the work in 1251, under the shadow of the imminent Mongol invasions. The Tripitaka Koreana is housed in 4 buildings collectively called Janggyeong Panjeon, that are laid out in a rectangular arrangement. The Hall of the Dharma Treasure and the Hall of Sutras are the 2 main halls as depositories of the Tripitaka. The 2 small halls to the east and west sides house wooden printing blocks of later Buddhist scriptures. At first glance the Janggyeong Panjeon seems to be built in quite a plain and ordinary style. However, the complex was in fact built to exact specifications to preserve the woodblocks by very sophisticated means. The location of the complex as well as the layout and structure of the buildings and windows maintain optimum ventilation, temperature, humidity and light intensity. Since the 18th century, 7 serious fires broke out at Haeinsa Temple, but the flames never reached Janggyeong Panjeon. Each block of the Tripitaka Koreana is composed of a board on which characters are carved. 2 wooden end pieces are designed as the handle attached on both ends. Each block measures 70cm by 24cm by 2.8cm and weighs about 3.25kg. 23 lines of text with 14 characters per line are carved in relief onto each block on both sides. The wooden printing blocks are also inscribed on the Memory of the World Register but I agree that the halls themselves together with the Tripitaka Koreana itself possess OUV as one of the most remarkable library structures in Asia. Writing and carving the text was an enormous undertaking that involved a number of craftsmen, officials and scholars for the different stages of the production and printing process of the Tripitaka Koreana. The wood for the woodblocks was soaked for long in sea muds or steamed in brine to soften the wood for carving and to protect the finished blocks from insect damage. The engravings are believed to have been done at Daesa-ri Namhaegun in the south coast of the Korean peninsula. The tidal range is very high there, so transporting and soaking the wood was quite easy. According to historical research, paper manuscripts were attached to the boards each with 23 lines of text and 14 characters per line. Scholars and officials had to practice before writing to ensure consistency in the calligraphic style. In order for the characters to be printed in the proper direction, the same side of the paper manuscript on which the text was written was pasted onto the block. Immediately before carving, vegetable oil was thinly applied to the paper making the letters show distinctly. Characters were then carved in relief on both sides of the woodblocks. Each carved woodblock was printed and compared with the original text to find any mistakes. Wrongly engraved characters were carved out on a separate piece of wood and then glued onto the spot that was carved out. This proofreading and correction work was done so meticulously that no traces of correction could be found in any of the woodblocks. The production of good quality paper during the Goryeo period made it possible to print the Tripitaka Koreana. To print it, a woodblock was evenly covered with ink, a piece of paper was placed on it, and then the paper was scrubbed lightly with an implement made of hair lumped with bee-wax. The original woodblocks can be seen through the wooden ventilation windows even though stanchions have been placed to avoid any possible damage to the fragile windows from the ubiquitous selfie sticks. Being there at 8:30am with our assigned monk meant that we had the place to ourselves. In 2000, after 9 years of work involving 100 experts and a cost of 8 million dollars, the Tripitaka Koreana was finally digitalized. Work is also underway to create a copper plate Tripitaka Koreana. All in all I enjoyed my visit and I would definitely rank it as one of the must see WHS in South Korea. Once or twice every year I try and put a little bit of extra effort into visiting a certain World Heritage Site. This is in the hope that it will reveal a little bit more about the place and also to stop me from getting blasé about consistently visiting some of the ‘most outstanding’ places on earth. This time around the site I picked out for a bit of special treatment was Haeinsa. I decided to partake in the Korean government's Temple stay programme. I wasn't after some kind of spiritual awakening, just a slightly more unique take on the functions of the temple. And that is precisely what the experience delivered. I stayed for one night, arriving on a very busy Saturday afternoon I was surprised to see just how many people had trekked up through the national park to arrive at the temple. It was the anniversary of the Tripitaka Koreana so the crowds were extra dense, making this by far the busiest WHS I visited in Korea. Although it detracted a little from the atmosphere the people certainly had the right idea. Staying in the temple overnight allowed me to see the compounds with the tourists gone, leaving only my fellow apprentices to view the life of the monks. The highlight for me was the drumming sessions that took place on the main courtyard on the giant Jingo-buk? (I am not very up on my East Asian drumming techniques but it was very reminiscent of the famous Kodo style from Japan). From the impressive drumming displays we were lead into the service in the ornately decorated main prayer hall. After this we had a tasty vegetarian meal were taught the basics of meditation and got a chance to ask a monk about his daily life. This was really interesting and added character to the whole complex. Whilst serving us copious amounts of tea our exceedingly friendly and knowledgeable teacher talked about how he trained to get to the monastery, the routines of daily life but perhaps the most interesting things were the part of their life that I would never have thought of. It was enlightening to find out that their kimchee contained no garlic or chilli's to prevent them from being aphrodisiacs. Also the monastery not only has a football pitch out the back, but that each new year of scholars has a different colour kit to wear, and perhaps most surprisingly of all, when our monk wasn't in the confines of the monastery he loved touring contemporary art galleries in Europe, admitting he has a particular love of the works of Egon Schiele (perhaps making up for a lack of garlic in his life?). This really added colour and a new level of understanding to this site visit for me. It was an early and restless night in a communal hall sleeping on an ondol floor, before we were woken up at 3:30am to start the second day's activities. We again witnessed the drumming and service before having another meal (the same food, but this time around it felt a little less satisfying). Then it was time for the 108 bows, I must admit to not really comprehending how much effort goes into this ritual, and I was sweating heavily by the time I had reach about 50 full prostrations, I had to really dig into my reserves to make it the whole way through, realising I am a long way from my former levels of fitness, and understanding why all the monks looked so fit and healthy. After some time to meditate my recovery from the morning's excursions was completed when we were taken off on a tour by our friendly teacher. This took us up to the highest part of the compound which is actually the World Heritage Site, being the housing for the Tripitaka Koreana engraved on wooden blocks. As an actual spectacle is isn't really that impressive, however given the surrounds of the temple and the knowledge of how old and complete this collection is really does make it astounding. If you don't fancy the idea of 3:30am starts and 108 full prostrations then you can also stay in the beautiful national park with-in walking distance of the site and wander in to see the drumming and services, as well as queuing for the chance to join the monks and their apprentices for meals. I would recommend the temple stay for anyone that wants to get a better understanding of life in the monastery. If you are looking for a spiritual experience then it may disappoint, but for me this was a perfect way of enhancing my understanding and providing a more unique site visit. Haiensa temple is a very nice place to visit. The limite of the WH site seems to be limited to four wooden building atop the temple complex, which are depositories of the Triptika Koreana. I went in may 2010, not knowing what to expect, since the internet site anouned the site beeing closed for the year. In fact there is no guided visit, but the site not totally closed. You can still view the wooden building from outside. And you can get a glimpse at the woodblock though the windows (slatted windows thourgh which air can penetrate). I enclosed a picture take through this window. There are signs banning photos, but many of the Korean tourists did not seem to care. The rest of temple compex is completely open, as is the mountain trails around which allow very nice walks. I was there on a sunny Sunday afternoon, the temple was overflowed by Korean tourists. But in the late afternoon, the place emptied. And in the evening, the place was almost empty. You can stay the night in various temple lodge, or to a bigger hotel close by. The village nextdoor is full of nice restaurants. From Seoul there are now fast KTX trains to Dongdaegu, and transferring from that station to the Seobu bus station can be easily effected by taking the metro to Seondangmot. On the bus ride to Gayasan National Park I met up with a number of fellow travellers, both foreign and local. None of these prepared me for the climb up to the site. But the effort was worth it to say the least. To see such an important facet of Korean history up close was indeed a privilege. One of the great temples in Korea, Haeinsa is located in Gayasan National Park about an hour Southwest of Daegu. 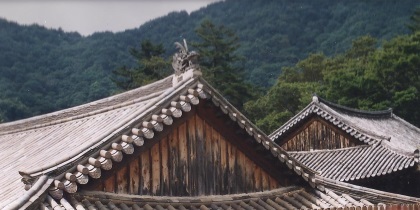 The temple itself is worth exploring, but the woodblocks is what makes Haeinsa truly special. The number of woodblock prints is stunning and considering that these Buddhist sutras are numerous centuries old is something to marvel at. Indeed, these treasures were commissioned during the Goryeo Dynasty. The temple and national Park are both great sites. Plan additional time getting to the temple as its a bit out of the way. In addition to basic logistics, there are factors worth considering. Haiensa is a great temple, but by no means is it the most authentic, exceptional, or representative of Korean Buddhist temples. 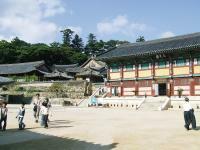 Its OUV lies primarily in the Janggyeong Panjeon, which was constructed to house the Tripitaka Koreana woodblocks. Tuck away deep in the forest of Gayasan National Park is Haeinsa, one of the three most important Buddhist temples in South Korea and maybe the second most famous temple in this country after Bulguksa Temple in nearby Gyeongju. As I mentioned Haeinsa is located in the national park, the scenery especially along the path to the temple is very beautiful with small steams and many tiny waterfalls in the very bright green forest, a real reward after taking 1.30 hour bus from Daegu thru many uninspired villages. The temple itself is quite big compared to other temple complexes. The most important structure in the temple is Janggyeon Panjeon the temple’s depositories for the Tripitaka Koreana woodblocks or Korean Buddhist bible. 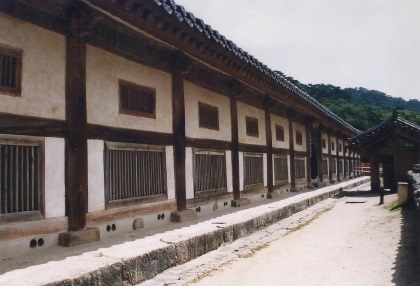 Janggyeon Panjeon is actually four plain storage buildings from 15th century keeping more than 80,000 woodblocks famously for its sophisticate design of conservative preserving all of the 13th century woodblocks without deteriorates. The masterly technique of this building is truly exceptional; however, for normal tourists it is really hard to appreciate these structures since there is no explanation for their uniqueness to differ them from other old buildings which is quite sad. Since most people do not know the importance of the buildings or it’s just quite hard to appreciate them, the equally impressive Tripitaka woodblocks are the main focal point of Haeinsa. The woodblocks took 16 years to complete and now Haeinsa’s Tripitaka is considered the most complete set of Tripitaka woodblocks in the world and used as the main source of Buddhist study in all East Asia. I really impressed Haeinsa by its unworldly sacredness and wonderful location which reminded me the same feeling toward forest temples in Thailand or Japan. While the famous Bulguksa is crowded with hordes of tourists like hell, Haeinsa is heaven, so if I have to recommend one temple to visit after Bulguksa, Haeinsa is my answer as the perfect place to heal you up from mainstream tourist industry. On March 28th, 2003 I walked from a Korean yogwan (travelers' inn) located near Haeinsa, up the path to the temple. I brought my two elementary school age sons with me to give them a feel for the Korean countryside, as well as the opportunity to see a Korean Buddhist temple and renowned collection of Buddhist literature. The inn itself was worth the visit for its wide "maru" porch and delightful dinner of "kimchee" dishes made from all kinds of roots, vegetables and seaweed. Sanjang Byeoljang is its name. We had a brilliant cool day. The magnolia and cherry trees were not yet blooming at the temple's altitude, but the air was clear and there were only a few groups of visitors spaced out throughout the temple, so there was no crowding and everyone got a good look at the Buddha Hall and the wood blocks. I visited the temple almost thirty years ago for the first time, and it is certainly in very good condition now. The monks on this visit were deep in meditation and conducting sutra chants in all the halls, even the smallest ancilliary buildings had a monk beating a wooden bell and chanting. An older monk came out of a small building just above the Buddha Hall and spoke with my sons. He made them promise not to fight and to treat each other with respect. He performed the promise handshake with each of them, linking little fingers and pressing the thumbs together. A promise not to be broken! There is little effort to engage the casual visitor like us. It would be nice to have a little more interaction with the monks if you wanted to learn more about the woodblocks, the Buddhist philosophy written on them, or the ceremonies that were being held. More effort on our part might have gotten us that kind of audience. I visited Songgwansa, another major Zen temple, many years ago. There a novice monk from New Zealand gave us a primer in Buddhism. Maybe they maintain that approach there. 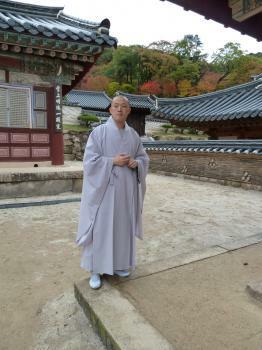 Haeinsa might do well to introduce such a program, even with Korean monks. We took the bus from the bottom of the temple path back to Daegu's Seobu Bus Station. The ride is comfortable and convenient, although finding the Daegu Seobu Bus Station is a $10 cab ride from the main train station. It was a long trip from Seoul to spend the night and see the temple. When the fast train line starts operating it will cut the time from Seoul to Daegu. 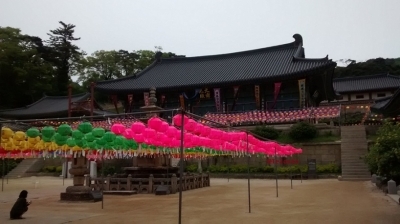 Nonetheless, Haeinsa is a splendid setting for a remarkable work of devotion. 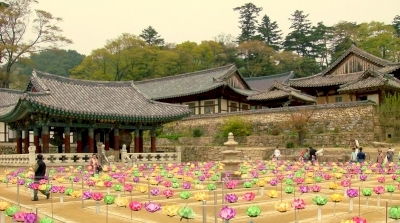 Prayer Labyrinth: Haeinsa Temple includes a prayer labyrinth near the center of the temple complex. The labyrinth path is lined by lotus flower decorations and leads to a very small pagoda in the center. Goryeo : Criterion (vi): The Janggyeong Panjeon and its unique collection of 13th century Tripitaka Koreana woodblocks, outstanding for their artistry and excellent execution of engraving techniques, occupy an exceptional position in the history of Buddhism as the most complete and accurate corpus of Buddhist doctrinal texts in the world.